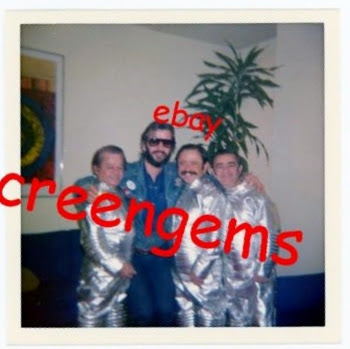 I typically don't share photos from eBay with large watermarks on it, but I am making an exception because this is such an unusual photograph. Let's just hope that "screengems" doesn't mind. Here is Ringo at the Capitol Records tower in 1975 when he was doing an interview. And he is posing with three actors that were munchkins in the classic 1939 film The Wizard of Oz . Billy Curtis and Jerry Maren and? Jerry is still with us at 98 years! R.I.P. Jerry Maren who passed away the other day.